The nearby dwarf galaxy NGC 1569 is a hotbed of vigorous star birth activity which blows huge bubbles that riddle the main body of the galaxy. The galaxy's "star factories" are also manufacturing brilliant blue star clusters. This galaxy had a sudden and relatively recent onset of star birth about 25 million years ago, which subsided about the time the very earliest human ancestors appeared on Earth. In this new image, taken with NASA's Hubble Space Telescope, the bubble structure is sculpted by the galactic super-winds and outflows caused by a colossal input of energy from collective supernova explosions that are linked with a massive episode of star birth. One of the still unresolved mysteries in astronomy is how and when galaxies formed and how they evolved. Most of today's galaxies seem to have been already fully formed very early on in the history of the universe (now corresponding to a large distance away from us), their formation involving one or more galaxy collisions and/or episodes of strongly enhanced star formation activity (so-called starbursts). While any galaxies that are actually forming are too far away for detailed studies of their stellar populations even with Hubble, their local counterparts, nearby starburst and colliding galaxies, are far easier targets. NGC 1569 is a particularly suitable example, being one of the closest starburst galaxies. 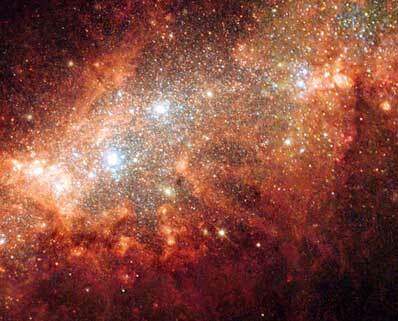 It harbors two very prominent young, massive clusters plus a large number of smaller star clusters. The two young massive clusters match the globular star clusters we find in our own Milky Way galaxy, while the smaller ones are comparable with the less massive open clusters around us. NGC 1569 was recently investigated in great detail by a group of European astronomers who published their results in the January 1, 2004 issue of the British journal, Monthly Notices of the Royal Astronomical Society. The group used several of Hubble's high-resolution instruments, with deep observations spanning a wide wavelength range, to determine the parameters of the clusters more precisely than is currently possible from the ground. The team found that the majority of clusters in NGC 1569 seem to have been produced in an energetic starburst that started around 25 million years ago and lasted for about 20 million years. First author Peter Anders from the Gottingen University Galaxy Evolution Group, Germany says, "We are looking straight into the very creation processes of the stars and star clusters in this galaxy. The clusters themselves present us with a fossil record of NGC 1569's intense star formation history." The color image is composed of 4 different exposures with Hubble's Wide Field and Planetary Camera 2 through the following filters: a wide ultraviolet filter (shown in blue), a green filter (shown in green), a wide red filter (shown in red), and a Hydrogen alpha filter (also shown in red).